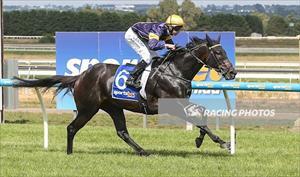 San Vincenzo broke his maiden in fantastic style at Ballarat on Sunday when taking out the Maiden Plate event over 1400m. Moroney knew exactly how he wanted this race to play out to get the very best out of this improving stayer and the plan certainly came together on the day. From the jump, under the guidance of stable rider Patrick Moloney, he got the front running trip he was looking for and set the early tempo. Moloney got him to relax into a nice rhythm out in front and controlled the race from there before storming home by an impressive margin, with plenty still left in the tank. His strong run right through the line left little doubt that this is a galloper looking for more ground, “After getting to know him well, we’re confident we’ve found the key to his success. We will evaluate how well he comes through this run but at this stage it looks like his next trip will be over the mile” said Moroney. The son of So You Think was purchased at the 2015 Gold Coast Magic Millions selected by Paul Moroney Bloodstock and carries the familiar colours of long-term supporters of the stable Rupert and Cheryl Legh. Congratulations to the winning connections: R & C Legh Racing Pty Ltd, Pulitano Thoroughbreds Pty Ltd, Mr R Smith, G G Ltd, Limerick Lane, B & C Thoroughbreds Pty Ltd.